Lake Hope Lake Hope is located in Vinton County. This small lake covers 120 acres of fishing water with 5.7 miles of shoreline. The lake lies within Ohio Division of Wildlife District Four(4). 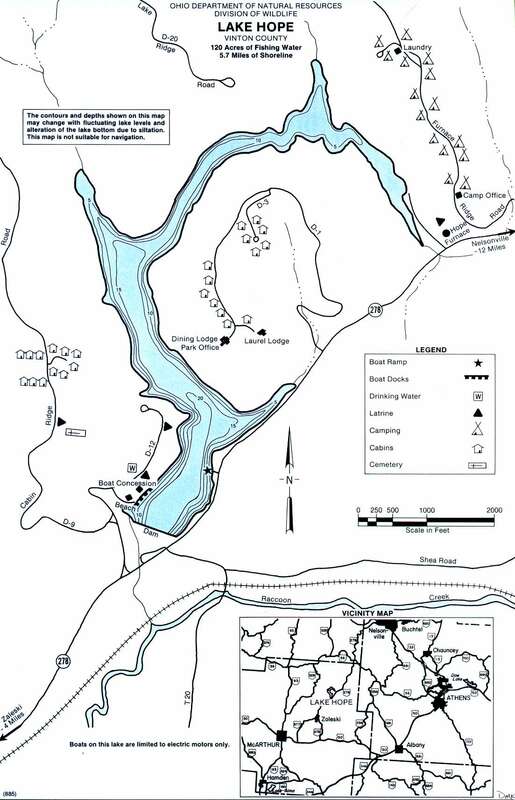 Location Lake Hope is located in Vinton County approximately 15 miles west of Athens – 10 miles southwest of Nelsonville – 20 miles northeast of Wellston. The lake is accessible from State Route 278. Distance from Major Cities 52 miles southeast from Columbus. 15 miles west of Athens. 190 miles south of Cleveland. 135 miles east of Cincinnati. Boating Information There is an 3-hp restriction on Lake Hope. Near the dam is a small primitive boat launch with a boat rental and beach nearby.